People celebrate outside of Cavanaugh's in University City for the Erin Express in 2014. 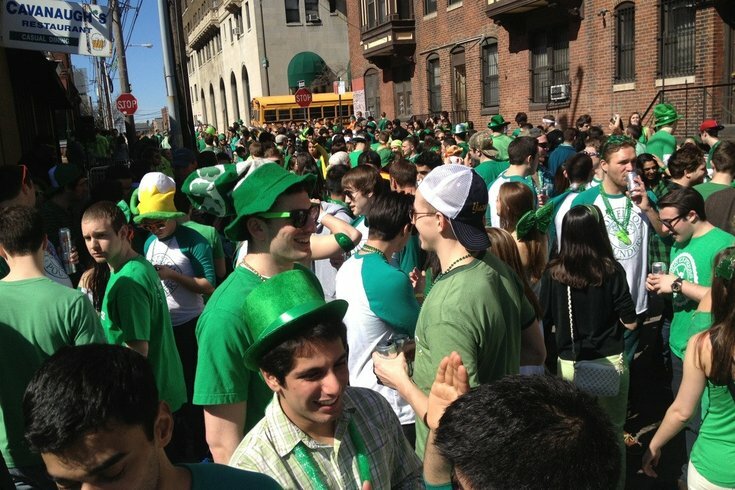 Love it or loathe it, St. Patrick's Day in Philly is not lacking character. Nor, as it turns out, accolades. Financial planning website WalletHub released an analysis yesterday that sifts through 100 major cities in search of the creme de la (Irish) creme of cities to celebrate St. Patrick's Day in. Philly clocked in at No. 4 on the list, sandwiched between Omaha, Neb., at No. 3, and fellow Pennsylvania city, Pittsburgh, at No. 5. The website further narrowed its analysis by weighing data among 17 additional factors. Heavy hitters in the breakdown included the number of Irish pubs and restaurants per 100,000 people, the average beer price, crime rate and forecasted precipitations. Sources drawn from include (but are not limited to) the U.S. Census Bureau, Eventbrite, AccuWeather, Kayak.com and the FBI. By category, Philadelphia ranked No. 11 among traditions, No. 29 among costs, (gratefully) No. 6 among crime and accessibility and No. 7 in the weather column. It accrued 63.97 points in total. According to what a WalletHub analyst told CBS3, Philadelphia's Irish population sits at 12 percent. That's slightly down from the 14.6 percent reported in 2007. Boston, meanwhile, made the top of the list, not faring all that much better with 71.16 points -- perhaps confirming that there still remains no Utopia for St. Patrick's Day.